The Old Hospital was built in 1931 by Mrs. Gordon of the Women’s Missionary Society of the United Church of Canada and was officially opened in 1932. There as suggestion the new hospital be named the ‘Laura Gordon Hospital’. Mrs. Gordon thanked everyone, but preferred it be known as the Burns Lake Hospital. It was once the largest and finest public building between Prince George and Prince Rupert. It was famous for its fine gardens on the west side. 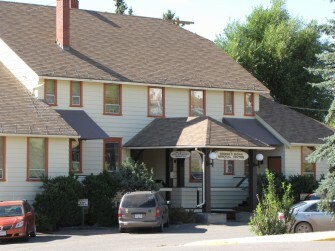 In 1982 it was declared a heritage building and was subsequently redeveloped as an office building by its tenant and owner, the Burns Lake Native Development Corporation.